On rivers, lakes and in the sea. 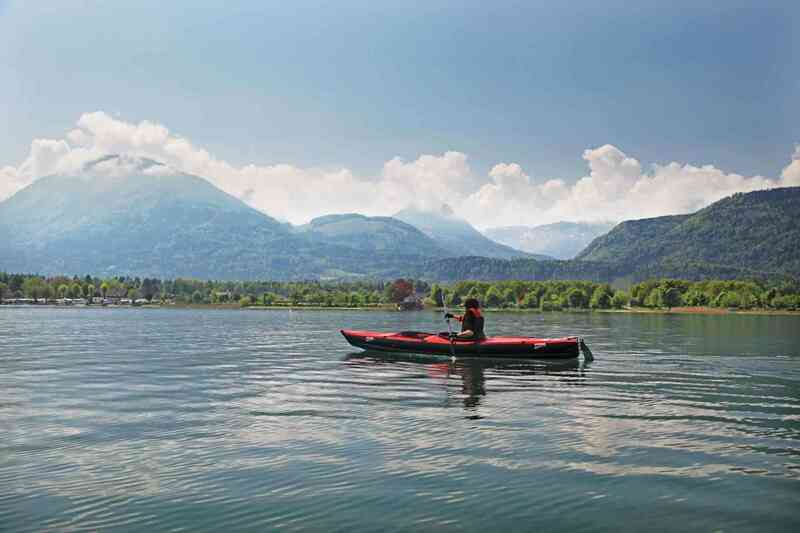 The professional kayak for solo-paddlers is a all-rounder for rivers, lakes and coastal trips at your holiday destination. Thanks to plenty of storage space, this inflatable kayak is suitable for multi-day trips on big rivers. It is perfect for a dream adventure as it can be easily transported in the boot of your car, train or in the aeroplane hold. This universal travel kayak can be used for many purposes and goals – just inflate it and you are ready to go. 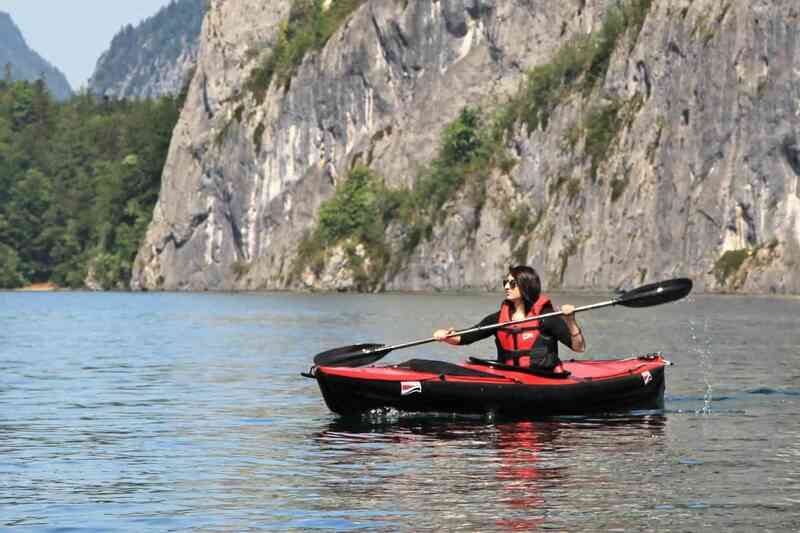 The professional single seater touring kayak. Athletic and narrow, the versatile ESCAPE 1 features a sleek design for unlimited exploration. Effortlessly the ESCAPE cuts through the water. The long water line of 420cm offers very little resistance and makes it a child’s play to move forward easy. The new designed V-shaped body with downward-shifting floor and the pronounced centre tube stabilise the ESCAPE and keep it on course. That makes the ESCAPE run exeptionally smoothly and directionaly stable! So that you keep control at all times! The deck is made of waterproof Grabner rubber boat skin and fixed permanently to the body of the kayak. This way you will always stay dry underneath the deck. After paddling splashing water drips off and the kayak can be packed dry in no time. The cockpit can be covered with an optional sprayskirt for additional protection in rough waters or on cold days. Thanks to the flat deck cross wind has only little contact surface, for easy run also on breezy days. What do you need to take with you on longer trips? There is plenty of space under the foredeck and reardeck and it is possible to secure exact fitting watertight bags. Also on the deck it is possible to attach watertight bags. Everything you need for multi-day trips. The serial bow net keeps water bottles and much more ready to hand. With small hooks a watertight bag can be placed on top of the net. The robust seat suits perfect for touring requirements. The flat seat surface ensures a low center of gravity for highest capsize stability. The backrest can be adjusted to the desired angle and for the relaxed paddler it is optionally available with a higher backrest. The foot braces, which come as standard, can be continuously adjusted and give you a firm hold in the boat: We know what is important. A handle is located left and right inside the cockpit. This way you can comfortably and easily carry the kayak sideways on your shoulder. The strong bow reinforcement strake absorbs impacts and protects the boat when getting into contact with stones or rocks.  The stern bracket, which is included as standard, allows you to mount an optional steering device or electric motor. “Steve the river walker” has about 9.000 km paddling experience. He works on a gigantic project. With his boat he paddles and documents all important rivers in central Europe. His large experience helped to develope the practical details of the ESCAPE. 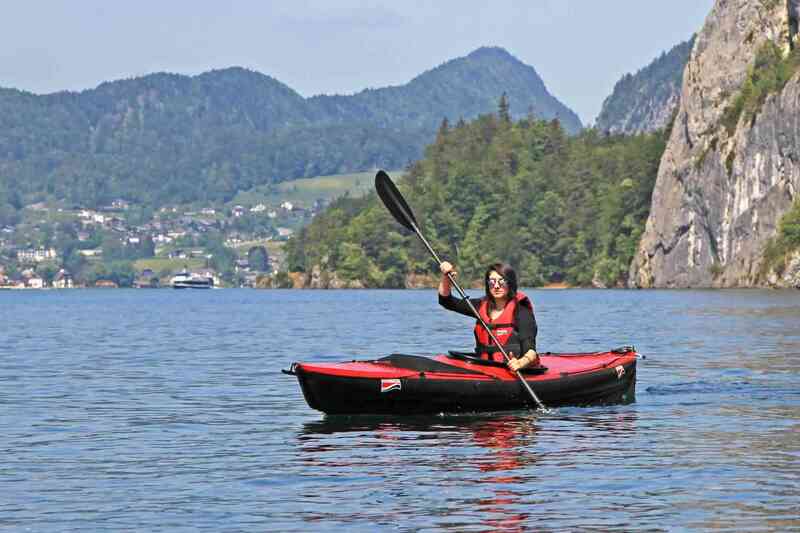 First impression ESCAPE 1 kayak trekking on lake Attersee. 1' 0" x 0' 6"